You don’t have to miss out on the spicy delights of Mexican food – these crisp lettuce cups are every bit as tasty and fully Food Optimised. Heat a large non-stick frying pan and spray with low calorie cooking spray. Add the garlic, onion, red pepper, chilli, cumin, paprika, chopped tomatoes, tomato purée and chicken and stir-fry for 6 minutes or until the mixture is hot and the vegetables are just tender. Season well and scatter over the parsley. 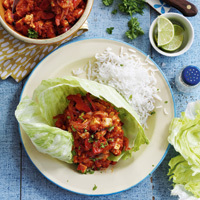 Spoon the chicken mixture into the lettuce leaves, fold them over to enclose the filling and serve with lime wedges and boiled rice.